Let’s face the truth and accept it, storage is more than often a troublesome issue to resolve. Many of us love to buy new stuff every now and then, but the primary issue after such a shopping spree, is mostly where to put all that stuff. Nobody would like to buy attractive things and then not be able to showcase them in an equally attractive manner (I mean that kind of takes the point away from it, doesn’t it?). And shoes are one of the most tiresome commodities to store. It is not easy to store your vast collection of footwear in a neat, chic manner. If not done right, the final result of a perfunctory storage is either a gaudy presentation or a lacklustre one. What we need is to store our shoes in a voguish manner, so as to highlight their beauty and equal their status in our heart (after all, we all love our shoes). So here’s how you can store your collection of shoes (no matter how humongous or petite it may be) in a fashionable manner. While shoe racks are the ideal storage locations for shoes, we will address them later, for they are slowly progressing towards being mundane (but that does not mean they cannot be tweaked to be in vogue again). A discreet shoe cabinet is perfect for those who own a large number of footwear and want to store them in a subtle manner. The size of the cabinet could be altered as per an individual’s whim. The cabinet could accordingly be made into one of a modern stylised storage unit, might be given a mahogany or walnut hue with a touch of white shade; or could be given a more rustic look. The most rudimentary utility is its depth. You can store dozens of shoes in the cabinet, and then use the entire cabinet as a way to showcase your picturesque artefacts. The artefacts could be kept on the top of the cabinet, which will accentuate its decorative aspect. The cabinet will thus, not only serve the purpose of storing your shoes in an inconspicuous manner but it also provide you with space to place your other suchlike beautiful commodities on. As you can see from the photo, a hanging shoe rack displays your artistic and practical side. You could either use a full-fledged hanging shoe rack or just a few strips of it, and then accordingly hang as many shoes as you want on them. This idea is perfect for those who do not own a lot of space in their closet and have a wall free to hang these strips. In many ways, this idea is similar to the way books are kept at some houses, with just floating glass strips. The difference being, in this case, you are putting up small strips (or an entire rack) and hanging your shoes from it. The idea shows your innovative side and helps put your shoes in a presentable manner. Remember those huge pipes you saw during a construction? Or the pipes you had read about when you were in school? Well surprise your mind because those pipes are not just meant for fitting and construction, they could also be used for making fun, innovative storage units for your shoes! Take a look at the image, what do you notice? Regular PVC pipes and shoes, and it is just as easy to make this “rack” as it is to admire it. All that you have to do is properly measure the diameter of the pipe (it has to be bigger than the tallest of your highest shoes) and then carefully glue the pipes together. You could make a fun, ascending/descending effect or try your own creativity with it. Just remember to carefully mark the diameter and glue the pipes together. Just imagine walking into someone’s room and then noticing such a shoe rack, wouldn’t you admire the ingenuity of it? Everybody loves a good ol’ fashioned armoire. Not only does it exude class but it also adds a regal and elegant touch to your entire room. Now you could obviously store all your clothes in it, but you could further it a notch by mixing in it the elements of a shoe rack (read adding you entire shoe rack in it). Instead of storing your clothes in it, you can store all your footwear in an ideal armoire and make it a creative work of practicality. The shoes will concord to the grand aura of the armoire and the armoire will easily settle in your room. Nobody will object to a wardrobe being in your room, and by making it a shoe rack, you are just having your own tongue-in-cheek moment. Earlier we had talked about storing shoes in an inconspicuous manner; now let’s talk about storing them in a conspicuous way. A glass cabinet is perfect for the shoe-lovers. You can put it beside your wardrobe or the TV, or any door. The glass cabinet will complement every side of your house and as is readily apparent, it presents your shoe collection in an elegant manner. If you have enough space, then you can make use of this idea and present the shoes you want to, the rest could be kept behind the ones in display. You could even switch it up by displaying shoes according to the season (and it is also of maximum utility in such a case). If you are proud of your shoes more than anything else, then you should surely go for this idea. An ottoman is a low stool or seat used either for resting your feet or providing a cushion for you to sit upon. Little do people know that ottoman as furniture has expanded its utility horizon and has begun to be used a shoe storage unit. These compact, graceful seats can be used as a way to store your shoes in a subtle manner and could then also be used for the ideal purposes of an ottoman (as mentioned above). You can get these from the market or get them specially made for you, and then use them for the dichotomy that they serve. Further, these stylised pieces of furniture add to the interior of a house and could be easily tucked away into a corner when not required. This idea is perfect for people who do not have much space in their house, so they could use the same furniture for storage and seating purposes. Okay so this is one of the most unconventional ideas we have heard/seen so far, but that only adds to its beauty. Now we know that normally it will be difficult to store your shoes in such a manner, but if you have got space enough, then why not? Not only is the idea creative and innovative, but it is also that something quirky your place needs to be a class apart from the others. Storing your shoes in such a manner will make them easily accessible, reduce the space it would have taken you if you would have opted for a usual shoe rack and fortify the modernised look of your place. So what do you say, why not give it a go? Possibly the easiest way to organise and store your shoe collection is through creating shelves. But shelves take up a lot of space and are oft considered to be a hindrance to the passage. So here’s an easy way to put up shelves: slide them over to the corner. Not only is this idea viable and efficient, it is also an easy way to access your footwear and keep them in your room in a creative manner. Sure, shelves are common to every household, but cornered shelves are not so common and storing your shoes over them makes them even more uncommon. You can put up as many shelves as you require and even stretch them to two corners of your room, but do not go beyond that for that could make it pro forma. How would you like to take an extra step towards being creative? 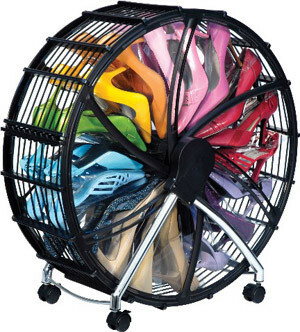 If you are up for it, then take a look at this idea, a spin wheel shoe storage. This idea is quickly gaining reputation and recognition throughout the world, probably the leading producer is Rakku Design. The idea has often met with cogent refutation and puzzled faces, but the idea is extremely viable and practical. The shoes are easily accessible, stored in a creative manner and the storage can store up to 30 shoes at a time (fair to say that can cover any individual’s need). This idea is perfect for those who wish to save some space and want to store their shoes in a corner (but we know, this is something you would want to present). So here you go, ten innovative, creative ways to store your shoe collection in a unique manner. Shoes are pivotal to a majority of people’s life and they deserve a proper space. As the epigraph says, having a good shoe is worthy of your admiration, even if it gives you a day full of miseries (but at least you get to relish in the beauty of shoe).